Discussion in 'Social Media' started by memme, Apr 22, 2018. 35 Social Signals ($6) Package FOR FREE ! - Daily visitor of BHW. No inactive user or once per month login user. - Have an Avatar image uploaded, no default Avatars! How to claim your free Review package? 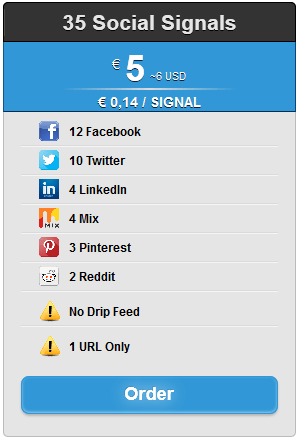 3) We add 5 Credits to your balance to test our Social Signal package for free ! Only one free review package per BHW member. Follow exactly the 1-4 steps to claim your free review copy. Thank you very much for your amazing review ! I'd like to see examples of your reddit signals as well. Nice service, got social signals as described in package. Thanks for the service..
Placed the order. Order id is 148869.
wow .. super fast order delivery ( order 148869 )... and very quick replies to the quieries ... awesome service .. Completed in just 2 minutes. Super fast. As expected, 35 social links from 6 authority websites. Thanks a lot. Just registered with id: prasad0889! Also put deposit of Euro 50 using Bitcoin..!!! Thanks, credits has been added to your balance. Hi, I think you left out the 5 euros as a bonus for trying social signs..!!! I have used the 50 euros for PBN..!! Everything was fine, got my social signals fast.